Dan OBrien is a renaissance man. He is a short-story writer, essayist, novelist and author of non-fiction books; a wildlife biologist; a rancher; a doctor of literature; and a world-renowned falconer. Nature is the star of his books - both fiction and nonfiction - his essays, and, for that matter, his life. The thread of falcons, especially the peregrine, is a constant in the fabric of his existence. This 50-something falconer from Ohio left his heart in the Bear Butte grasslands as a boy. Eventually, he bought a ranch in the shadow of the mystic landmark and joined efforts to save the peregrine from extinction in the western United States. 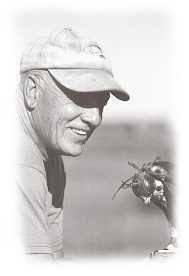 He returned to South Dakota in the 70s, as a teacher at the University of South Dakota and then as a biologist for the state of South Dakota. He went on to become an endangered species biologist for The Peregrine Fund and an English instructor in the doctorate program at the University of Denver. He bought a ranch in the shadow of Bear Butte. He describes the bittersweet journey that evolved out of one of his efforts to repopulate falcons in a well-received nonfiction book: "Rites of Autumn: A Falconer's Journey Across the American West." He published his first novel, "Spirit of the Hills" in 1986, and followed up the next year with "Eminent Domain," a collection of short stories. That was followed by "Rites of Autumn" (nonfiction) in 1988, "In the Center of the Nation" (fiction) in 1991; "Brendan Prairie" (fiction) in 1996; and "Equinox: Life, Love, and Birds of Prey," a nonfiction memoir, in 1997. His articles and short stories have appeared in publications ranging from the New York Times to the Michigan Quarterly Review. He has written four screenplays, one for Steven Spielberg. As a rancher, hes got his eye on the bottom line  he raises cattle  as well as the skies. He has replanted native grasses on his land, reconstructed a wetland and has started raising buffalo. Now, hes embarking on a new career, on screen, with A FALCONERS MEMOIR, produced by H2O Productions, which he owns along with Sam Hurst, a former NBC News producer who also raises buffalo; and Bill Harlan, award-winning columnist and writer whose byline appears often in the Rapid City Journal.